Baked radish chips were a big hit with the kids, so I was hoping that crispy edamame would also appeal to them. I used a recipe from allrecipes.com by Sophia Candrasa. It was really simple. We used frozen shelled edamame that we had first thawed with cool water as the recipe suggests. We coated the shelled edamame with olive oil, parmesan cheese and salt and pepper and baked them at 400 degrees for 15 minutes. Super easy. 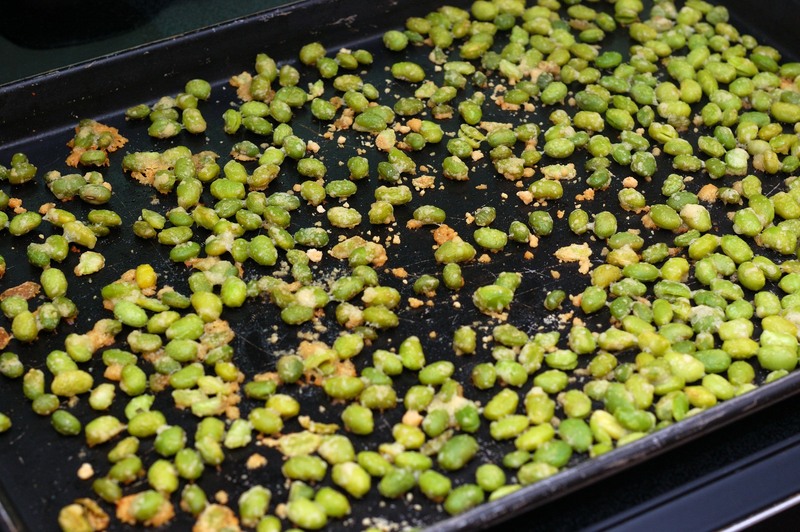 The crispy edamame looked and smelled delicious when they came out of the oven. Would they taste delicious? Aww… two-thumbs down. Josie and Theo wouldn’t even consider tasting them. I thought that these crispy edamame smelled fantastic. I could not wait to taste them. I was disappointed because I thought they were just ok. Definitely not wonderful. I think the taste could grow on me. As usual, Dave thought they were great. 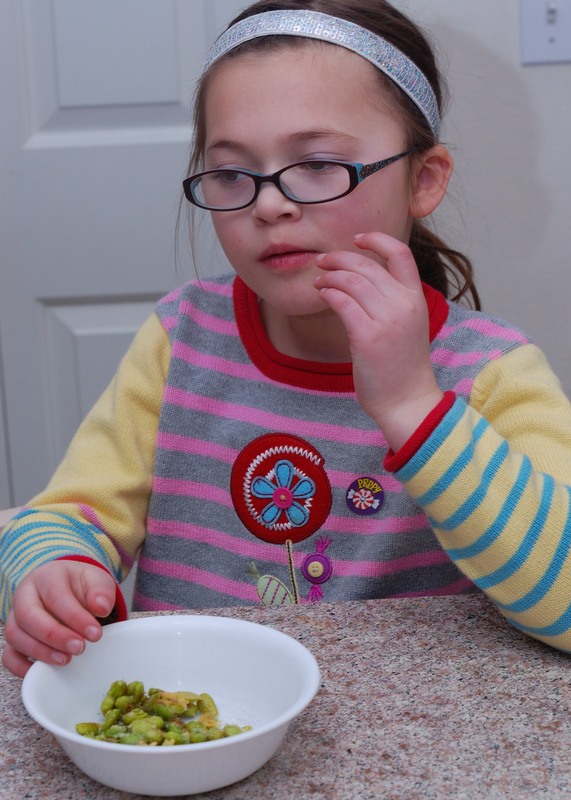 I was impressed by Lucie’s willingness to try the edamame again and her optimistic attitude that she might like them prepared in a different way. We are in our sixth week of trying new vegetables with the kids and I am very happy with how things are going. The most important goals of this project are learning new things, having fun with the kids and exposing them to vegetables and recipes they might like to try. It is not about making them eat something they do not want to eat. So when I read about the book It’s Not About the Broccoli: Three Habits to Teach Your Kids for a Lifetime of Healthy Eating by Dina Rose, I headed straight to amazon. The book arrived a few days ago and so far I have only had time to read the first few pages, but I can’t wait to read more. In the first chapter, the author makes the point that 30% of all children between the ages of two and three do not eat any type of vegetable on any given day and when they do, the vegetable is most likely a french fry. I am hoping to get my kids eating two or three kinds of vegetables almost every day because they want to. I look forward to reading more about the authors approach to encourage the kids’ healthy eating. In the last six weeks I have tried several things I never thought I would try and I have enjoyed many of them. I love hearing from you about what recipes sound good to you and about your favorite ways to prepare the veggies we are trying. Please continue to share your thoughts with us. The kids love hearing your comments too! Don’t forget to follow Counting Our Veggies on Pinterest, where you can see boards for other recipes and vegetables we are considering and find all the recipes we have used on our blog. We tried a new edamame recipe. I though I was going to like it because it looked good. 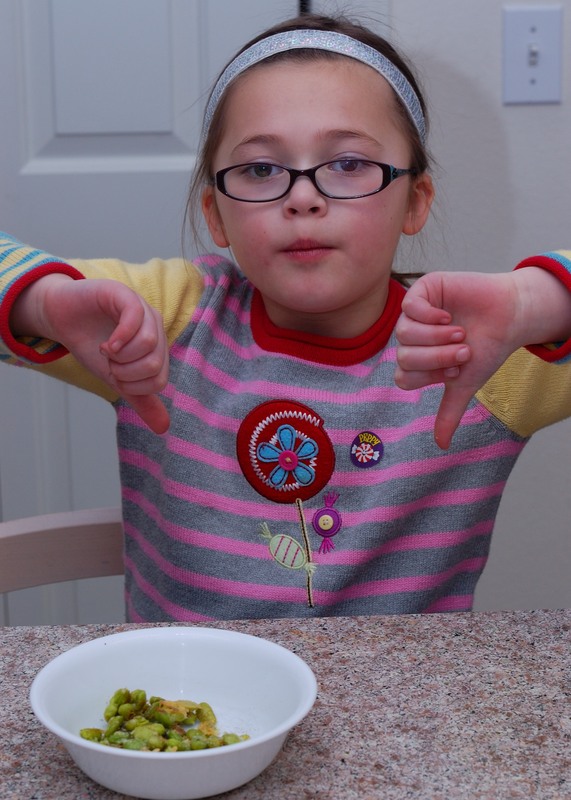 I did not like it and I gave it two thumbs down. Categories: Edamame, Veggie Books | Tags: edamame, parmesan | Permalink.